Withania somnifera, also known as Ashwaganda, Winter Cherry or Indian Ginseng, is a plant from the Nightshade family. It is cultivated heavily in India and is native to parts of the Middle East, the Indian Peninsula, and the Himalayan regions. Withania somnifera is a short perennial, that features elliptical green leaves and small white bell shaped flowers. They grow into lantern like cases, which contain bright red cherries bearing dozens of tiny seeds. 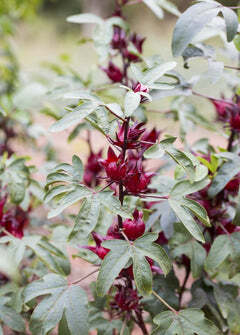 Ashwaganda is drought tolerant, loves full sun, and is an essential herb in our medicinal garden. It grows up to 3 feet tall, and can be grown in deep pots. The root is ready to harvest 150 to 180 days after planting, just as the berries have formed and the leaves have begun to yellow. We carefully harvest our Ashwaghanda roots in the fall by digging up the entire plant and separating the roots from the base of the plant. We remove the red berries from the leaves and sun dry the roots and the berries separately. Ashwaganda is widely known for it's medicinal properties in Ayurvedic medicine. The root is the most commonly used part. Taken as a tea or in tincture form, it is believed to reduce anxiety and depression, and to help achieve mental clarity. Recent scientific studies have shown that Ashwaganda's medicinal effects are due to the presence of alkaloids and steroidal lactones within the plant. These chemicals promote anti-inflammatory, anti-tumor, anti-stress, and antioxidant effects. Ashwanganda also has an overall immune system boosting effect according to several studies. This is a great medicinal plant for any herbalists garden! Soil & Moisture: Performs best in high and dry sandy soil with consistent watering.